The idea that identities are constructed is one that has jived so well with me that it’s no wonder it’s followed me since my undergraduate studies at Oberlin. At Georgetown, considering it’s a linguistics program, we’ve been taught that a lot of what is understood more broadly as “identity construction” really happens through language. It’s co-constructed, emergent in interaction, expressed through narrative, in what we say as much as what we don’t. You yourself probably made an identity claim of some kind or another at least once in the past hour! 1) van Langenhove, Luk & Rom Harré. 1999. Introducing Positioning Theory. Harré R & van Langenhove (eds), Positioning Theory: Moral Contexts of Intentional Action, pp 14-31, Oxford: Blackwell. Positioning theory is a useful heuristic for understanding identity construction through the lens of narrative. Perhaps this has something to do with the fact that it’s really based on 3 interrelated concepts: positions, storylines, and speech acts. So the idea is that the positions we inhabit as social beings influences/are influenced by the storylines we follow in a conversation or the speech acts associated with them. An easy example from institutional discourse: You can tell a lot about who “has power” in a conversation by speech acts, i.e. you’ll find the “agenda setter” has special privileges to ask questions, initiate new topics, where other participants could be censured for talking out of turn. This is certainly true when the “agenda setter” is in the setting (say City Hall) where his/her position is ratified, but what happens when that person if caught off guard, or in a non-traditional setting? See here to read more about how a politician negotiates his position as “man of the people” vs. “public enemy #1” in an impromptu encounter with protesters. 2) du Bois, John W. 2007. 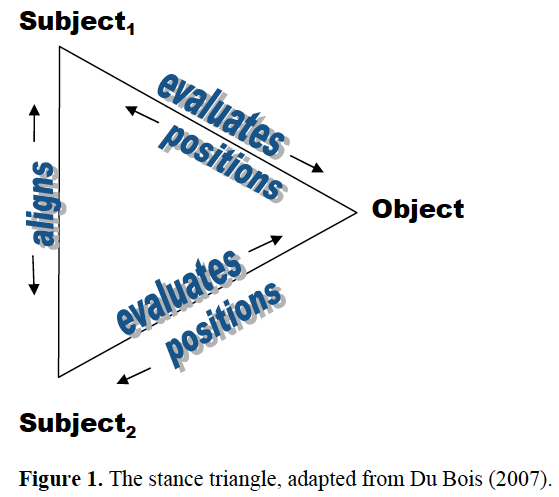 The stance triangle. Robert Englebretson (ed), Stancetaking in discourse: Subjectivity, evaluation, interaction. Amsterdam: Benjamins. 3) Chiang, S.Y. 2010. ‘Well, I’m a lot of things, but I’m sure not a bigot’: positive self-presentation in confrontational discourse on racism. Discourse & Society, 21(3), 273-294. It should be clear by now that the relationship between identity work and politics is a consequential one. One’s image is not the same as one’s public record, so politicians expend a lot of resources crafting their public appearance. Despite this, some matters still remain in the court of popular opinion, so to speak. Chiang (2010) is a great resource on the topic of racist discourse as it intersects with the ideological free vs. hate speech debate. This and other research in linguistics demonstrate how the Other is constructed in public discourse and the media and for what purpose. See here for my own research on this topic.